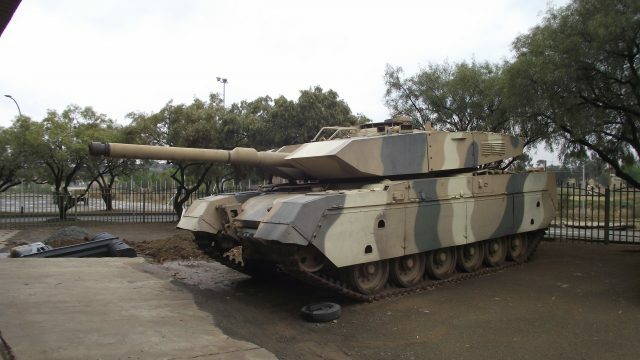 The Olifant Mk1B Main Battle Tank (MBT) takes its Afrikaans name from the African Elephant. 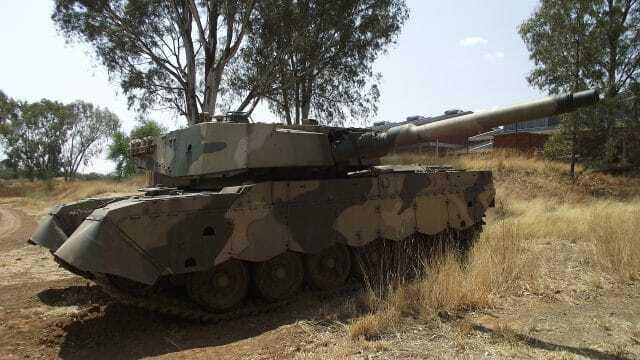 The Olifant is the largest land animal and in a similar vein the Olifant MBT is the heaviest military vehicle in the then South African Defence Force (SADF) and its successor the South African National Defence Force (SANDF). 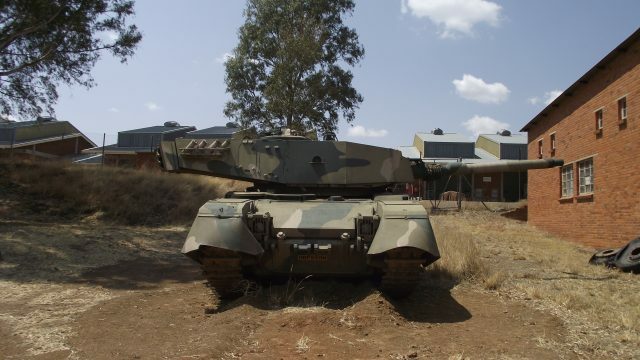 The Olifant Mk1B is a complete rebuild of the Olifant Mk1A, adapted for the African battle space and the lessons learned from the South African Border War (1966-1989). It was designed and produced at a time when South Africa was still subject to international embargoes because of its racial segregation policies (Apartheid). Set against the backdrop of the Cold War in Southern Africa which saw a steep rise in liberation movements backed by Eastern Bloc communist countries such as Cuba and the Soviet Union. Unlike the Mk1A, which is an upgrade from the Centurion Mk.3/5 hull, the Mk1B was a complete rebuild and in doing so left behind the legacy, features and outer look of the Centurion MBT. Development of the Mk1B commenced soon after the Mk1 went into production in 1981. 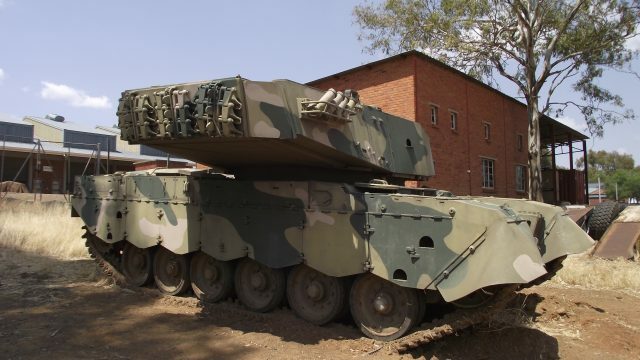 The Olifant Manufacturing Company (OMC) set out to design and build an interim MBT that would improve on the shortcomings of the Mk1A which were exposed during the South African Border War such as poor armor, poor mobility, improved firepower and taxing maintenance requirements. The Mk1B was designed to face off against T-55, T-62, and T-72A MBTs, which are equipped respectively with 100mm, 115mm and 125mm main guns. The primary focus, therefore, was placed on protection followed by improved firepower capabilities, then mobility, and lastly reduction of vehicle maintenance and crew fatigue. A total of 44 Mk1B (2 x prototype + 42) would be built starting in 1991. South Africa is the sole user of the Mk1B of which 26 were upgraded to Mk2 standard in 2005. Presently 12 Mk1Bs are in storage with 1 South African Tank Regiment. The design, development and production of the Mk1B were undertaken due to the increasing number of Soviet-supplied tanks in Southern Africa. It was particularly feared that the Soviet-backed Cuban forces in Angola would ship T-72A MBTs to the Angolan theatre. The possible deployment of T-72A MBTs necessitated a much better protected, mobile and lethal South African MBT than the Mk1A. Although the African battle space favours a wheeled configuration, the Mk1B was envisaged to retain its predecessor’s role as an MBT. The Mk1B can ford 1.2m of water without preparation. With regards to the mobility question, the Mk1B kept the Continental 29 litre turbo-charged V12 diesel engine of the Mk1A. Improvements to the engine enabled an additional 100hp which totaled 850hp and raised the horsepower per tonne from 13.39hp/t to 14.4hp/t. A necessary improvement considering that the Mk1B weighed 3 tons more than the Mk1A. A new automatic transmission called AMTRA 3 was assembled by Gear Ration and installed in the Mk1B which provided double-differential steering (four forward gears and two reverse), two-speed mechanical steering drive and hydraulic retarder. The additional 100hp and new automatic transmission allowed the Mk1B to achieve a top speed of 58km/h (36mp/h) on a road which was a further improvement over the Mk1A’s 45km/h (28mp/h). The old Centurion Horstmann suspension was replaced with a new torsion bar suspension system with hydraulic dampers which provides an overall 300-400% improvement in wheel travel if compared to the Mk1A. Bump stops where fitted to all the road wheels in order to improve off-road mobility while telescopic dampers were fitted to the front and two back stations to reduce rocking when stopping the tank. Steering is done via a yoke instead of tillers. The overall result of the improvements is a less taxing driving experience for driver and crew, especially over rough terrain. The fuel capacity remained the same as the Mk1A, 1240 litres (328 US gallons). Subsequently, the Mk1B can travel 350km (217mi) on road, 240km (149mi) off-road and 150km (93mi) on sand. 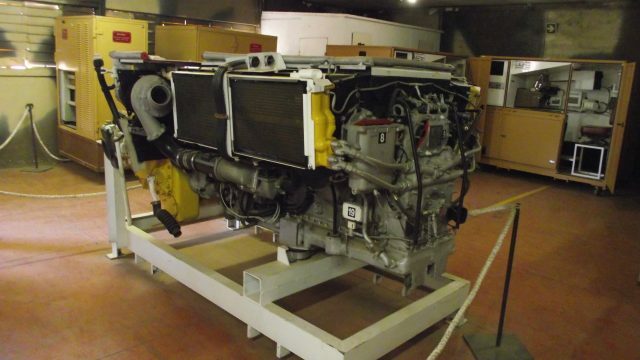 With the redesigning of the hull, the engine compartment was extended, allowing more space for easier maintenance and if required, removal and replacement of the entire power pack. In an effort to reduce the frequency of road wheel replacements an outer polyurethane surface was applied which increased the road wheel life from 300km (of the Mk1A) to 1200km on the Mk1B. With the extended engine compartment which lengthened the overall hull, an additional track link was added which brought the total to 109 track links on each side. The Mk1B is equipped with one 7.62mm coaxial machine gun with a 2000 round ready bin that replaced the 200 round boxes used in the Mk1A. At least 6000 rounds of 7.62mm are carried. The Mk1B features tactical radio communication which allows for reliable command and control, enhancing the tank’s force multiplier effect on the battlefield. Based on the lessons learned during the South African Border War with the Mk1A, the Mk1B features two drinking water tanks (one left and one right) inside the turret with a combined capacity of 101 litres. The water can be accessed from the commander’s and loader’s station and reduces the necessity to leave the tank to fetch water. Less logistical tasks reduced the need for replenishment from an administration and logistic support vehicles from the echelon. The addition of a fume extractor fan helps clear the interior crew compartment of excess fumes from the main gun. New and more comfortable seats were also installed to help reduce crew fatigue. The Mk1B carried a standard complement of four crew members, consisting of the commander, gunner, loader, and driver. The commander’s station is located on the right side of the turret and features a newly designed cupola also offering a 360-degree field of vision through six vision blocks. Entry and exit from the commander’s station are achieved through a hatch. On the right side of the turret, just below the commander`s station is the gunner’s station which is fitted with a day and night sight and to the left of the turret is the loader’s station. The loader also sports a periscope for better overall situational awareness. Entry and exit for the former and latter are through the gunner’s and commander’s cupola and in case of emergency, the loader can escape through a hatch of his own. The driver’s station received a more ergonomic overhaul and a new digital instrument panel and a yoke-type steering stick which improved comfort and reduced driver fatigue. Driver visibility was improved with the addition of a third driver’s periscope thereby increasing situational awareness. The central periscope can be replaced with a passive night driving periscope allowing full day/night capability. The driver can enter and exit his station through a new single-piece hatch or in emergencies escape hatch in the floor. The Mk1B retained the South African produced 105mm GT3B rifled gun barrel manufactured by Lyttleton Engineering Works (LEW). A new thermal sleeve and fume extractor help improved sustained accuracy when firing and reduce barrel droop due to heat by as much as 70%-90%. The M456 High Explosive Antitank (HEAT) rounds could effectively penetrate 420mm of Rolled Homogenous Armour (RHA) at any range. Armour Piercing Fin-stabilised Discarding Sabot (APFSDS) rounds with the ability to penetrate 580mm of RHA is also used. All the main gun rounds were imported with the exception of the High Explosive (HE) round which is manufactured by Denel in South Africa. The Denel M9210 HE round contains a TNT/HNS filling with an effective blast radius of 17m. The round is fired with a muzzle velocity of 700m/s to a maximum range of 9km. Dispersion at 3 km is within 0.3m x 0.3m. The fighting compartment saw safety improvements with a total of 65 main gun rounds carried in protected stowage bins below the turret ring. The turret bustle was extended which added more room for crew equipment. The bustle extension also helped balance the overall turret weight distribution, putting much less strain on the new solid state electrical gun control system and turret drive which could traverse the turret in a full circle in 16 seconds (an improvement of 10 seconds over the Mk1A). An infrared/white searchlight was added above the main gun. 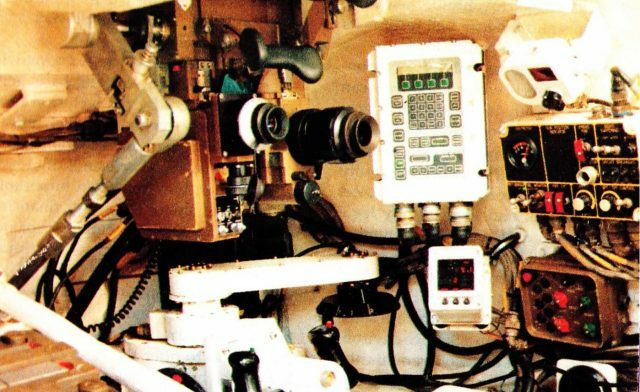 In 1990 the SADF tasked Reutech Systems to develop a new fire control system to replace the 30-year-old system on the Mk1A. The fire control system was known as the High Frequency Tank Fire Directing System (HIFF) and consisted of a state of the art (for the time) ballistic computer system and sight drive electronics coupled to a touch button control system and sensors which accurately measured meteorological conditions such as ambient temperature and wind speed from the environmental sensors which could affect the fire accuracy of the main gun. The new system allowed the gunner to select a target and in less than two seconds the fire control system would calculate a fire solution and notify the gunner via a ready to fire light that the main gun was on target and ready to fire. The system could also hit a moving target while on the move itself by adjusting the main guns aim after incorporating the targets distance, speed and relative speed thereby maximising first round hit probability. The gunner makes use of an Eloptro 8x gunner’s day sight with an integrated ballistic computer which was added to the gunner’s sight. Co-mounted is a laser range finder which is accurate up to 10km. Data from the rangefinder is fed into the split range drum, which applies elevation to the main gun. Tests revealed that the system is accurate within 50m x 50 m at 2 km which is perfect for the South African Lowveld (open stretches of grass plains). Interior view of Olifant Mk1B gunners station. Source: SALUT MAGAZINE. Having established that the Mk1A is vulnerable to Soviet T-55, T-62 and T-72A MBT`s, an upgrade of the Mk1B’s armor was undertaken. The Mk1B retained the original Mk1A’s armor, which consisted of 118mm (4.64in) on the frontal glacis at 60 degrees, 152mm frontal turret (6in), 51mm (2in) on the sides, 40mm (1.57in) on top and 19mm (0.7in) in the rear. An armor upgrade installation program took the form of several passive composite armor packages over the frontal glacis plate and turret (front, sides and top). A gap in between the original Mk1A turret and the add-on turret package was left open to act as spaced armor against High Explosive Anti-Tank (HEAT) rounds or which could be filled if needed in future. The total thickness of the armor package upgrade and the composition thereof is classified, however, given the threat level posed it would be reasonable to argue that they would be sufficient to deal with 115mm HEAT rounds used by Soviet T-62 tanks. Being modular the add-on armor package can be replaced in the field if it is damaged. The entire hull could shrug off the feared 23mm anti-aircraft gunfire. Furthermore, the threat posed to the Mk1A by Rocket Propelled Grenades such as the RPG-7 is negated with the mentioned upgrades to the Mk1B. The armored steel skirts of the Mk1A redesigned allowing for easier removal while still providing additional protection against RPG-7s. The constant threat of landmines in Southern Africa necessitated the addition of a double armored floor (with the torsion bars between the floor plates). A new fire suppression system (automatic & manual) was installed in the crew and engine compartment to reduce the likelihood of a catastrophic fire or explosion if hit. The stowage bins received lids to reduce the chances of content ignition if the Mk1A’s is hit. The smoke grenade banks were prone to damage when “bundu bashing” (driving through dense vegetation) which encouraged the relocation thereof to the rear of the turret on the Mk1B. Two banks of four smoke grenade launchers were fitted. Additionally, the Mk1B can also generate a smoke screen by injecting fuel into the engine exhaust. The hull headlamps are armored and a V-shape bush basher bar could be added to the nose of the hull. The total additional weight adds up to just over 3 tons. Two Mk1B Bridge Laying Tank (BLT) were built which are employed by the SANDF engineering corps. The Mk1B was developed as a stop gap while the SADF were looking to acquire a brand new MBT. The Logim project was aimed at researching, developing and manufacturing a complete domestic MBT. The project reached the prototype phase with one working model build known as the Tank Technology Demonstrator (TTD) which looked very similar to the Leopard 2A4. The technology developed for the TTD would eventually be transferred to the Mk1B Optimum in addition to a new lighter turret made of advanced ceramics with a reminiscent shape found on the Leopard 2A5. Additionally, the Mk1B Optimum would feature rubber side plates to detonate medium HEAT rounds and at the same time, save weight. After the fall of the Soviet Union and the 1994 democratic elections, the new SANDF had a significantly reduced budget. Hence the TTD and Optimum projects were cancelled. Most of the technologies would eventually be transferred to the Mk2. The Mk1B was, for all practical purposes, a leap forward in protection, mobility and firepower over its predecessor, the Mk1A. However, several problems came to light, such as the poor power to weight ratio and the failure of the main gun system to exceed the performance of the Mk1A. Additionally, the desired fight ability improvement was not achieved. These shortcomings motivated the SANDF to look for further improvements which led to the Mk2 which made use of many of the TTD technologies. Carroll, S. 2017. Olifant Mk1B. Date 2-4 Oct. SA Armour Museum, Bloemfontein. Erasmus, R. 2017. Olifant Mk1B. Date 2-4 Oct. SA Armour Museum, Bloemfontein. Erasmus, R. 2017. Olifant Mk1B. Date 21 Nov. Telephone interview with Olifant Mk1B project leader. Harmse, K. 2017. Olifant Mk1B. Date 16 Nov. Vaal Mall, Vanderbijlpark. Global security group. 2015. Olifant Mk1B. https://www.globalsecurity.org/military/world/rsa/olifant-1b.htm Date of access: 16 Sep. 2017. SALUT Magazine. 1996. Advance technology. October Edition. SADF living history group. 2015. Armour. http://sadfgroup.org/equipment/armour/ Date of access: 16 Sep. 2017. Mk1B Optimum. Both Illustration by Tank Encyclopedia’s own David Bocquelet. The current shape looks like chinese Type 96’s turret front. I going to go with this article and say the Optimum’s turret looks more like a Leopard 2 turret then a Type 96’s, especially considering there is rumours that the Germans were helping to develop the TTD and Optimum. This article’s pictures are of the Olifant Mk2. Nope, they’re not. This is the Mk1B variant. The Mk2 variant will get an article soon. I have read both articles now, as well as the Olifant Mk1 article and have realised why I had the tanks mixed up. I did not known there was a seperate Mk1. i thought the Mk1 was the Mk1A and the Mk1A was the Mk1B, thus the MK1B was the Mk2 either with or without the commander’s sight. Yes, we probably need a separate article on the Olifant Mk.I, the Semel and the Skookian. Hi there. Where did you get the information for the dispersion of the GT3B 105 mm tank gun? I can’t seem to find any test information on the L7 or related guns on the internet. The sources for the article are located at the end. Not all are obtainable as some are interviews or visits to real life areas. About data for the 105mm L7, relatively speaking, few people have obtained such data through various means and places such as archives. You may find scraps of accurate data on the L7 on the web in the least likely of places. Actually your articles helped set me right, however more information on each individual tank would be good. As I am sure that you know how little information about South African military equipment is out there. In your section on the Mk1B Optimum it state that the turret is “reminiscent” of the Leopard 2A6, but isn’t it more likely to be the Leopard 2A5 as it was being developed and entering service at around the same time the Optimum was also being developed? In addition, the Leopard 2A6 is a further development of the 2A5, which was the first to feature the wedge turret shape. Well, the turret is mostly identical, so it doesn’t quite matter. But yes, it would be better to reference the contemporary one.